Abstract: We study Nb-AlOx-Nb Josephson junctions (JJs) with a phase-discontinuity κ created by a pair of current injectors attached to one of the Nb electrodes. For κ ≈ π the Josephson potential energy U as a function of the averagephaseψ acrosstheJJhastheformofa2π-periodicdouble-wellpotential.Thus,thedevicebehavesasaϕJJ withdegenerategroundstatephasesψ =±ϕ (thevalueofϕ dependsonthesystemparameters).Experimentally, the existence of two wells of the potential is conﬁrmed by the observation of two different critical currents Ic±, corresponding to the escape from different wells. We investigate the escape of the Josephson phase from both wells by collecting statistics of the switching currents. The histogram of switching current exhibits two peaks corresponding to Ic±. 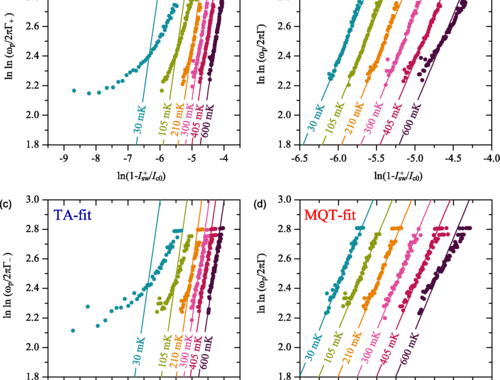 The dependence of the width σ+ and σ− of each peak on the bath temperature T indicates thetransitionfromthermalactivationtomacroscopicquantumtunneling(MQT)atT  ≈260 mKasT decreases. We argue that the observed saturation value of σ+ and σ− below T  is indeed related to quantum tunneling rather than to parasitic noise in the system, as the histogram width can be reduced by tuning the value of κ away from π. The comparison of the experimental escape rate  with theoretical predictions further conﬁrms MQT of the phase ψ from both wells.